Breast cancer gets a LOT of attention. There are marathons, bumper stickers, and pink EVERYTHING. And it IS the most common cancer diagnosed in women in the United States. So all that awareness is fantastic. Ovarian cancer, on the other hand, could sure use a publicist. You barely hear a peep about this other female cancer. Yet around 22,530 will walk out of their doctor’s office this year with an ovarian cancer diagnosis. And nearly 14,000 women will lose their fight. In its early stages, ovarian cancer symptoms are rare. Which is why it often goes undetected until it has spread. And that makes it much more difficult to treat. In fact, ovarian cancer falls fifth in cancer deaths for women. That’s a terrifying track-record. So ANYTHING we can do to help extend the lives of women battling this killer SHOULD be making headlines. But I can practically guarantee you haven’t heard a thing about THIS incredible breakthrough. It’s an all-natural approach. And researchers say it could DOUBLE cancer survival rates in women with ovarian cancer. In a new study, a component of everyday vitamin E sent cancer survival rates skyrocketing after surgery. Vitamin E contains eight distinct compounds… four tocopherols and four tocotrienols. And ONE of those, delta-tocotrienol, was the focus of a recent breakthrough study conducted at Vejle Hospital in Denmark. 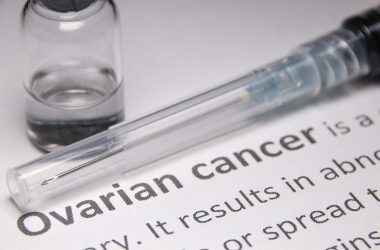 After surgery, a group of women with advanced ovarian cancer started on a combination of the standard drug treatment Avastin, along with a tocotrienol supplement. Three times a day the volunteers swallowed a 300 mg supplement which was 90 percent delta-tocotrienol. And the results were nothing short of incredible. One of the main ways scientists measure how well a cancer treatment works is what they call the “stabilization rate.” And that just means how long someone with cancer lives without the disease getting worse. In the case of the combo, the stabilization rate was an impressive 70 percent. And there was low toxicity, which means it was safe too. The combo stabilized the cancer by 50 percent at six months. While the drug alone only reached 25 percent. In the end, the addition of the tocotrienol NEARLY DOUBLED SURVIVAL rates. If you, or someone you care about, is battling ovarian cancer this natural, safe solution is something you’re going to want in your corner. Talk with your doctor about making it a part of your treatment plan. And to be sure you’re getting all the benefits look for a formula that’s standardized to 90 percent delta-tocotrienols like the one used in the study.